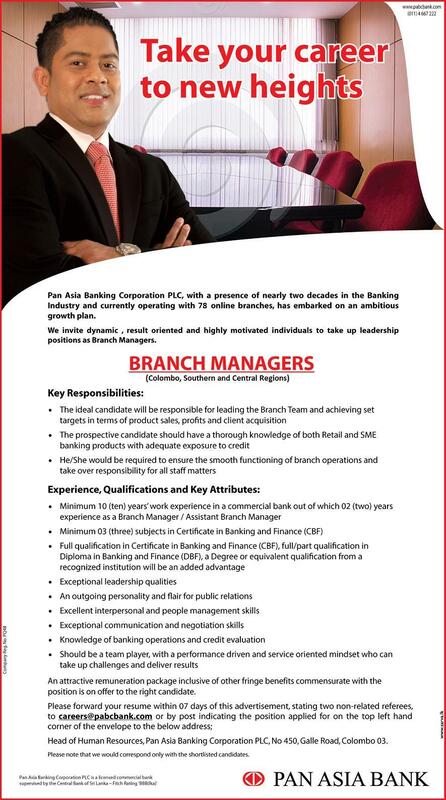 Highly experienced Bank Managers wanted for Pan Asia bank for Colombo, Southern and Central regions. The ideal candidate will be responsible for leading the Branch Team and achieving set targets in terms of product sales, profits and client acquisition. Minimum 10 (ten) years'work experience in a commercial bank out of which 02 (two) years experience as a Branch Manager / Assistant Branch Manager.